Complete the search form now to get car rental deal for the price you like! Visit the town of amazing historical scenery with cheap car rental Tours! Whether you’re looking for an upmarket luxury car or just want a comfortable vehicle for family travel, car rental Tours offers you wide variety of the best car rental deals to fit the bill. Besides, prices for our car hire service are always transparent and booking procedure is quite simple. Experience what the real essence of reliability and comfortable drive is with car rental Tours! Choose the most suitable Tours car rental location, get acquainted with Must Know and look through the Places to Visit with car rental Tours! 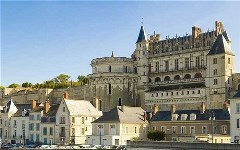 Tours is the largest city in the Loire Valley located on the lower reaches of the Loire River between Orléans and the Atlantic coast. 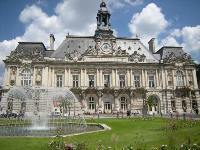 Tours has long had a reputation of a conservative, bourgeois town. But an increasing number of passengers from Paris are making a measured provincial life more lively. Tours is the center of the old Touraine region, known for its vineyards, wine, castles, as well as for the perfect ion of its local spoken French. Tours is known in France as the "Garden of France" since it has some great parks and numerous ancient bridges spanned over the Loire make the town more charming. 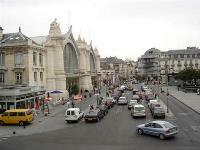 When you are in Tours be ready to drive on the right hand side of the road. Always carry your driving licence, vehicle registration document, and certificate of motor insurance. The sequence of French traffic lights is red, green, amber (yellow) and back to red. Amber means stop at the stop line. Speed limits are reduced in rain, when the second limit shown above applies. When visibility is less than 50m, e.g. in fog or heavy rain, speed limits are automatically reduced to 50kph on all roads. Reflecting the development of the Gothic style the cathedral is dating back to the 12th century. The west front, flanked by twin towers, with three doorways, is richly decorated in Flamboyant style, while the towers show the first signs of Renaissance influence. Enjoy fine views of the cathedral with your car rental Tours. For many years this place has been one of the most important squares in the community of Tours. If you are looking for the place which is the centre of community affairs, then get car rental Tours and go to this vibrant hub of the town. It is filled with local entertainers and artists, bars and restaurants gathering many people. 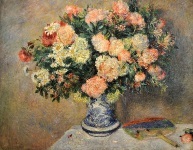 The Museum was established on the basis of a private collection. It is home to a large permanent collection of fine art works, paintings, sculptures and pieces of furniture ranging from the 14th Century to the 20th Century. Some of the most famous names in the European art scene are represented in the extensive range of galleries. Get car rental Tours and come to enjoy the masterpieces presented here. This is a neo-Byzantine basilica on the site of previous churches built in honor of St. Martin, bishop of Tours in the 4th century. 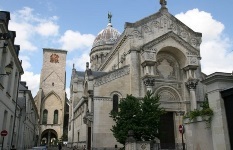 The basilica was built in the 11th-13th centuries and destroyed in 1562 and 1802. The new basilica, with the tomb of St Martin, was built between 1887 and 1924 in neo-Romanesque/Byzantine style. This place is worth visiting by your car rental vehicle. RentalCars24h.com offers you reliable car rental Tours services that will help you to feel free and independent when moving around the town. Providing best online prices for car hire Tours services, RentalCars24h.com allows you to save money each time when you rent a car in Tours.